KATHMANDU, Feb 21: Credit growth of the BFIs toward agriculture sector nearly doubled in the first half of FY2017/18, a recent data of Nepal Rastra Bank shows. The central bank's data shows that outstanding credit of BFIs toward the agriculture sector rose by Rs 27.2 billion, or 30.2 percent, over the six months of the current fiscal year, compared to a growth of 13.6 percent in the corresponding period of the last fiscal year. The outstanding credit of BFIs in agriculture sector stands at Rs 117.24 billion as of January 2018, according to the NRB data. Total lending of bank and financial institutions (BFIs) during the period grew by 30.2 percent. The surge of the credit on agriculture sector comes in the wake of the central bank's push to channelize the financial resources toward productive sector including the agriculture sector. Though the BFIs have failed to meet the regulatory requirement of extending 10 percent of total credit on agriculture sector, they have been increasing their loans to farmers as reflected in the data. Even when the lending has nearly doubled, BFIs are short of regulatory requirement. For example, commercial banks in total have floated only 6.8 percent of their total lending on agriculture sector compared to 10 percent requirement. NRB has not only made it mandatory for BFIs to channelize their certain percent of loans on priority sectors including the agriculture, but it has also been providing interest subsidy to farmers on the agro loans. The government, through the central bank, has been providing interest rate subsidy up to 5 percent on certain sector of agro, farming and livestock loans. Under the scheme, which was introduced to encourage commercial agro and livestock farming, particularly among youths, BFIs float loans for commercial agro and livestock farming businesses including vegetable production, processing and storage, floriculture business, livestock farming, and fishery, among other enterprises. The maximum loan that a borrower can get from BFIs under this scheme is Rs 50 million. BFIs can float loans higher than Rs 50 million by getting approval from the monitoring and coordination committee formed at the central level and the district level. Lending toward animal farming/service has gone up by highest. 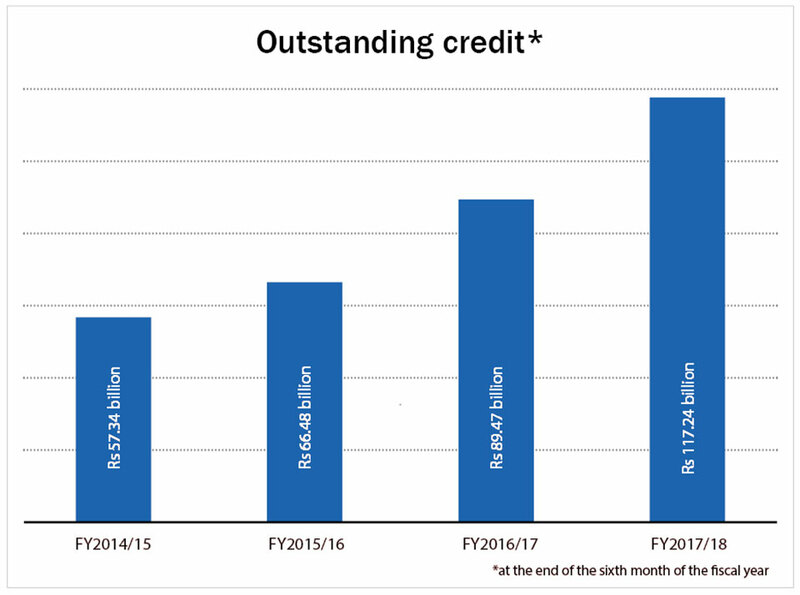 According to the data, BFIs' outstanding credit to this sub-sector went up 24.2 percent to Rs 40.16 billion. Similarly, outstanding credit on farming and farming service rose 17.3 percent to Rs 13.42 billion. Outstanding credit on Tea sub-sector also went up 3.4 percent to Rs 3.06 billion. Outstanding loan on 'forest, fish farming and slaughter'' sub-sector, however, fell by 4.6 percent to Rs 1.74 billion. Similarly, outstanding credit on other agriculture and agricultural services climbed up 41.9 percent to Rs 58.86 billion in the review period.